Home » Life Hacks » Family » Should You Get Life Insurance for Your Kids? My father was a financial planner, and he got his start by selling insurance. That meant Dad had some very strong opinions about insurance in general, and life insurance in particular. He was not shy about sharing those opinions with a captive audience — aka, his daughter. Even though I heard Dad opine (and rant!) on any number of finance-related subjects, the viewpoint that stuck with me most was Dad's stance on life insurance for children. "There is no reason whatsoever to ever buy such a product," he told me on more than one occasion. "Life insurance is for income replacement. Policies for children are morbid." 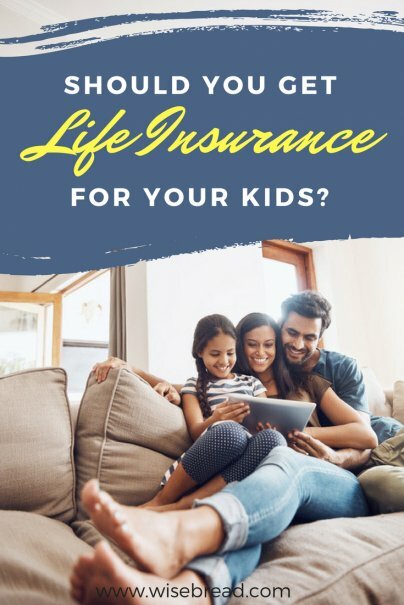 While part of Dad's objection to life insurance for kids stemmed from the exploitative practices you can find among disreputable insurance salespeople, he was also quick to admit that his own superstitions about tempting your children's fate added to his distaste for the products. The average funeral in America costs about $10,000. Financial experts (including my father) might say that parents needing to pay such expenses for a child should use their savings to do so. But considering the fact that half of all Americans couldn't come up with $400 in an emergency, the expert opinion may not match most people's financial reality. My dad did have an answer to this objection, however. There are many funeral homes that will offer their services free of charge for families who cannot afford the burial costs of losing a child. That means parents who are considering life insurance for their children just because of the potential cost of final expenses might not actually need a policy. Not only is it unlikely that you will ever need the insurance payout, since it's relatively rare for children to die, but you will likely be able to find financial help or free-of-cost services if the worst should happen. However, Dad's view didn't consider whose income will need to be replaced after the death of a child. The majority of children do not have an income, of course — but it's important to remember the very real cost of grief. Heartbroken parents may find themselves paralyzed by their grief and unable to work. Having a financial cushion can help keep a family afloat during a terrible time when work may be the last thing on anyone's mind. If you absolutely have to bring in every cent of your paycheck to manage your family's finances, a life insurance policy for your kids could potentially protect you all from the devastating costs of grief. Something that never came up in Dad's comments about children's life insurance was the importance of future insurability. While a child's life insurance policy is generally much smaller than those purchased by adults, they will often include a rider known as the guaranteed additional purchase (GAP) that a child can rely on once he or she reaches adulthood. This GAP rider will allow the child to purchase additional coverage as an adult without medical questions or underwriting. I have seen firsthand just how important such coverage protection can be. My best friend's son was diagnosed with autism at 15 months of age. My friend had not purchased a life insurance policy for her baby, even though she had intended to do so. Unfortunately, this means her son is now permanently ineligible for life insurance because of his autism diagnosis. Once he reaches adulthood, he will not be able to purchase a policy for himself. And autism is only one of several juvenile medical diagnoses — including diabetes, severe asthma, cancer, or a heart condition — that can render a child ineligible for life insurance in the future. This is why my friend now recommends that every parent buy life insurance for their children when they are still babies. At the very least, it will allow the child to have coverage throughout his or her life, no matter what medical surprises may be in store. For instance, the Gerber Grow-Up Plan, one of the most commonly advertised life insurance products for children, promises that "each time you make a monthly premium payment for your [policy], Gerber Life sets aside a small amount of money. Over time, this becomes the cash value of your policy. It represents how much your policy is worth at any given point in time." However, the cash value can potentially be less than the amount you have paid in premiums, since only a portion of your premiums are set aside. And the cash value will certainly be less than you would have earned through a traditional investment had you invested the premiums instead. While there are legitimate reasons for choosing a life insurance policy for your child, the investment strategy is not one of them. Despite my about-face on children's life insurance, my two sons are still uninsured. Dad's superstition about tempting fate has stuck with me — and my husband and I are lucky enough to be in a financial situation where we could handle the monetary costs if something terrible should happen. My only big concern is if either of my kids receive a diagnosis that will make them ineligible for future insurance. But we have decided to live with that risk. It's important that all parents think through the full consequences of buying or not buying life insurance for their children. It is a distressing train of thought, but a necessary one. No matter what you choose, a well-thought out decision will lead you to what's best for your family.